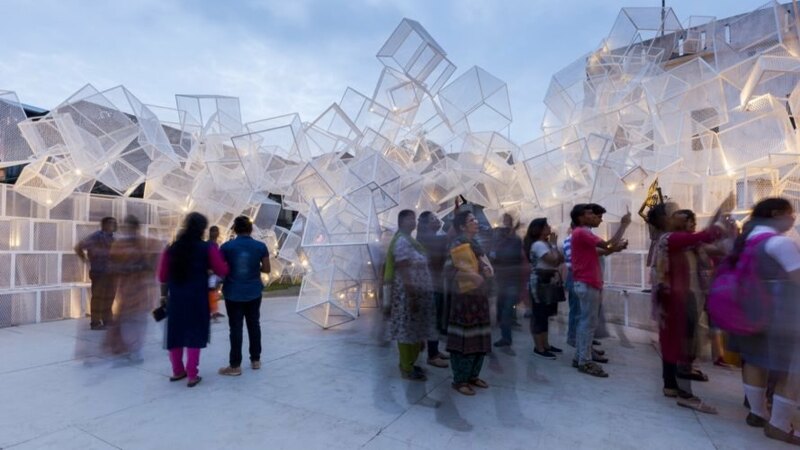 West Bengal’s biggest annual festival recently saw the addition of a strikingly contemporary pavilion that is 100 percent recyclable in Kolkata, India. 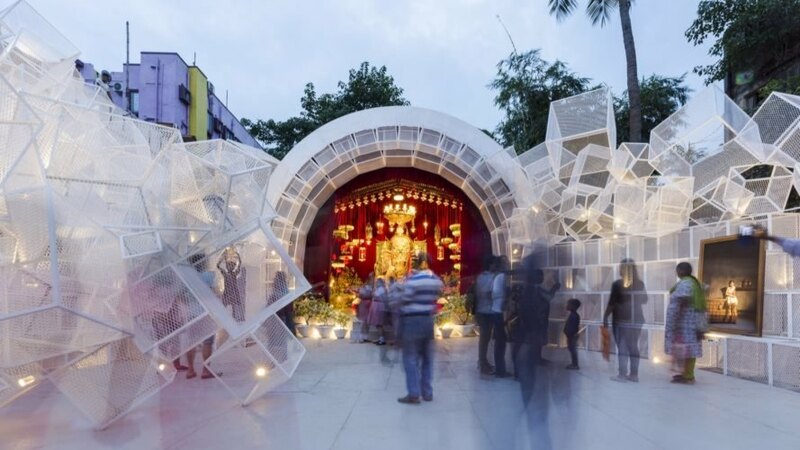 Designed by Abin Chaudhuri of the firm Abin Design Studio, the metal mesh pavilion was one of many temporary pavilions — or pandals — constructed to honor the goddess Durga as part of a five-day Hindu festival called Durga Puja. 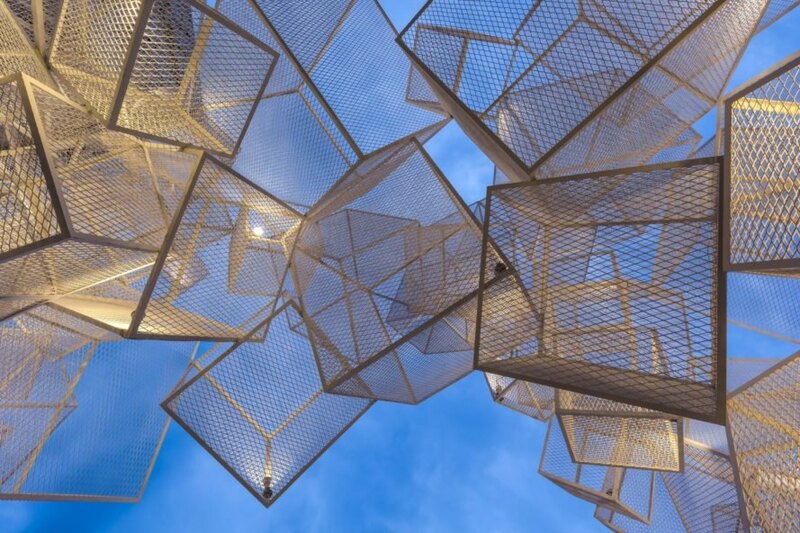 Unlike the other pandals, which are typically built of natural materials and reference traditional motifs and artworks, Abin Design Studio’s creation is architecturally modern with a dynamic form made from steel wire cubes. Installed inside an alley surrounded by buildings, Abin Design Studio’s Festival Pavilion stands out from its predecessors for the way it embraces the site. Rather than covering up the buildings, Abin Chaudhuri regarded the structures as a backdrop for his stacked cubes of steel wire mesh. 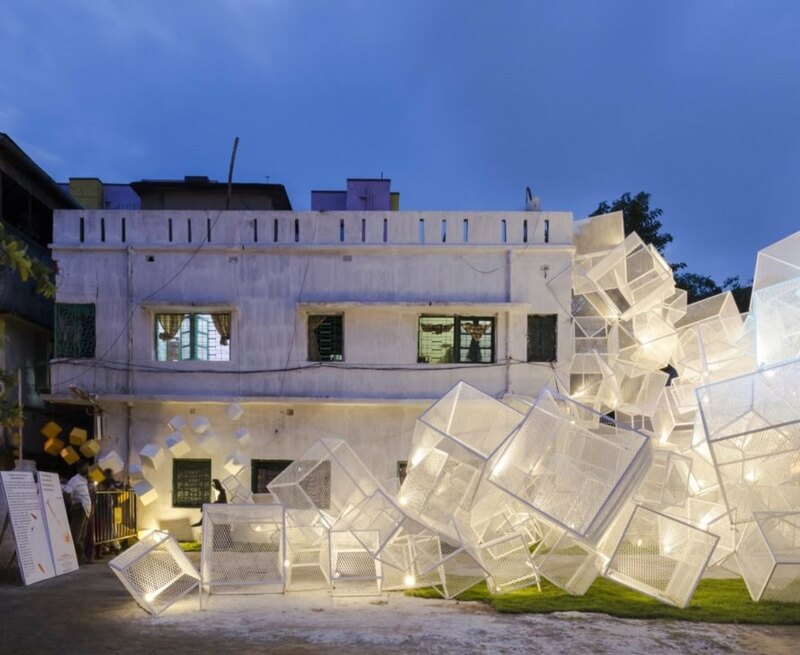 The pavilion, which appears as a heap of cubes threatening to topple at any moment, is not only used to frame the deity, but it has also been manipulated to create an entrance arch and immersive sculptural artwork. 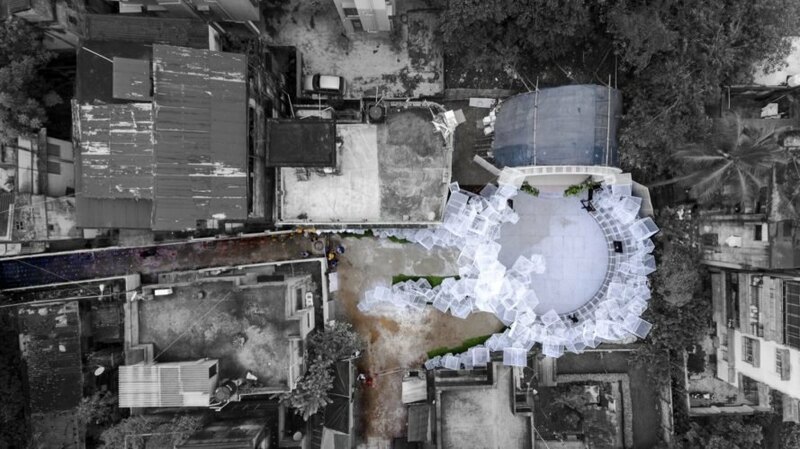 All parts of the temporary 350-square-meter pavilion are recyclable, from the steel mesh cubes and bamboo framing system to the plywood support system for the platform and stage as well as the old newspaper folded into origami birds. Moreover, the pavilion was also created as a module that could be replicated to activate forgotten urban spaces throughout the city, even in non-festival times. Abin Design Studio imagined this striking pavilion. The pavilion is part of the Durga Puja festival to honor the goddess Durga. 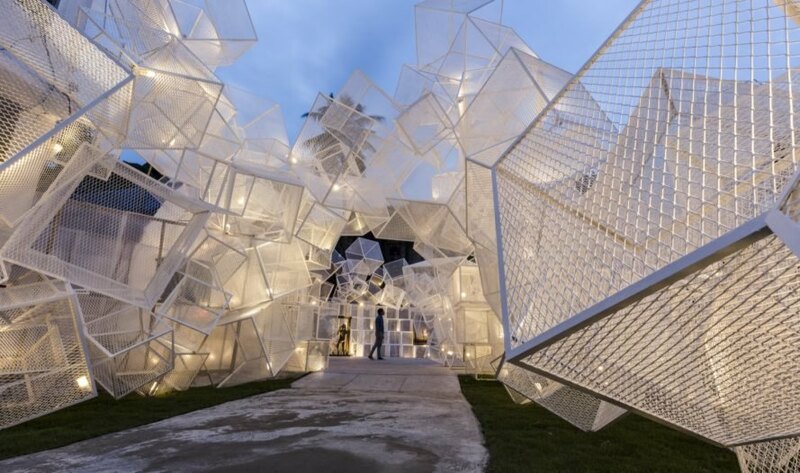 The pavilion is made from 100 percent recyclable materials such as steel wire cubes. The structure sits in an alley surrounded by buildings. The cubic installments serve as a work of art. Rather than take over the surrounding buildings, the pavilion embraces them as a backdrop. The designer created the pavilion as a module that can be replicated to activate forgotten urban areas, even during non-festival times.